Chickens are wonderful, comical creatures that have been domesticated for thousands of years. While keeping backyard chickens was common 100 years ago, in the 1950s the advent of factory farming and inexpensive store-bought eggs led to a decline in its popularity. Recently, however, there has been a resurgence of interest in keeping one’s own chickens, both for the pleasure of fresh eggs and for the entertainment pet chickens provide. All domesticated chickens belong to the same species, Gallus gallus. 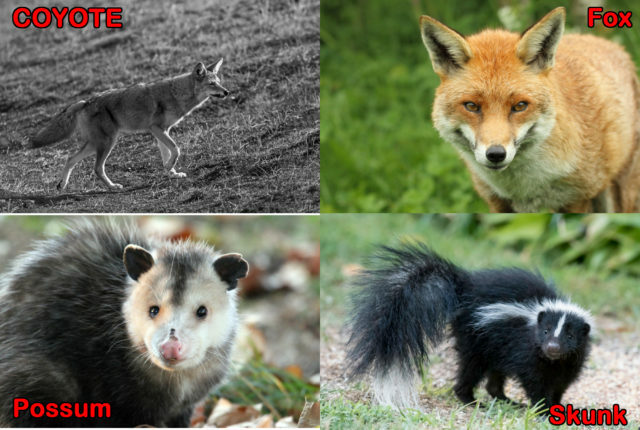 Within this species, there are hundreds of different breeds. Different breeds of chickens have different temperaments, behaviors, hardiness, and egg-laying capabilities. All chickens, however, have the same basic requirements to stay healthy: a good quality diet, a clean environment, and protection from the elements and predators. Good nutrition is crucial to maintaining a healthy flock. All chickens should be fed a crumble or pelleted diet formulated to meet their nutritional needs. They should get plenty of fresh feed daily and should be allowed to eat as much as they want. It is important to feed a diet specifically made for baby chickens, called a chick starter/grower diet, until 20 weeks of age. Chick starters are higher in protein (20%) and fat (4%) than are feeds made for adult birds. Due to a large number of eggs they produce, laying hens have very high requirements for calcium, protein, and vitamins, and should be fed a laying diet. Laying diets are typically 16% protein and 3.5-5% calcium. If despite a laying diet your hens are producing pitted or thin-shelled eggs, you can supplement their feed with crushed oyster shell. While a laying ration is critical to the health of laying hens, this diet is too high in calcium for roosters and for hens not laying eggs. These birds should be fed a maintenance diet. If you are unable to find a maintenance diet at your local feed store, an alternative is to dilute good quality laying ration with 20% scratch or fresh fruits and vegetables. Choose your chickens’ food carefully. Purchasing a nationally recognized brand is almost always a safe bet. If you buy your food from a local feed mill make sure they have a good reputation, as small mills may not use strict quality control. When purchasing food, make sure the food is fresh by checking the expiration date on the package. Food that is stored too long, whether in your garage or at the warehouse, loses nutrients. Store your chicken’s food in a clean, dry, rodent-proof container. Insects and rodents carry bacteria and parasites that can cause health problems for your birds. Keep this container in a cool area away from light, heat, and moisture. Excess heat can cause rapid breakdown of vitamins in the food, and moisture can lead to the growth of toxic molds. It is best to keep the food stored indoors or in a garage to help prevent temperature extremes. Treat foods such as scratch do not contain the protein, calcium, and vitamins your birds need to stay healthy. Although useful when trying to lure a wayward hen into the coop, scratch and other grains should only be offered in small amounts. Many chickens also love food treats such as corn, bananas, tomatoes, or leafy greens. Healthy treats such as these make a nice supplement to a pelleted ration. Make sure to avoid feeding highly salted foods, chocolate, avocado, alcohol, or caffeine, as these foods can make your bird ill.
One way to provide greens to your chickens is to allow them to “mow” your lawn for you. If your yard is such that you are able to let your chickens wander about safely, make sure not to use pesticides or herbicides in your garden. And be forewarned… you may need to protect your favorite flowers and vegetables from unwanted intrusions! Access to clean, fresh water is very important for all chickens. Laying hens have particularly high requirements for water, and water deprivation for only a few hours can cause a decline in egg production. Water consumption may increase dramatically on hot days, so check your chickens’ water supply frequently. Water dishes should be thoroughly scrubbed with soap, rinsed, and refilled with clean water at least once a week. To avoid spillage and discourage rodents, use hanging feeders and waterers for adult chickens. If you have a large flock of birds, make sure to provide enough feeders such that the local bully can’t prevent the others from eating. The ideal henhouse is easily cleaned, provides shelter from the elements, and protects its occupants from predators and rodents. It should be roomy, well insulated, and well ventilated. Allow a minimum of 8 to 10 square feet per bird. For flooring, concrete is easiest to clean. Cover the floor with 8” or more of pine shavings. At least once a week, removed any soiled or moist litter, and replace with dry litter. If desired, dropping boards can be placed under perches and feeders. For laying hens, provide nest boxes in a quiet, dark area of the coop. Four hens can comfortably share a nest. Chickens are ground-dwelling birds during the day but like to roost off the ground at night. Provide perches at a comfortable height for your breeds of chickens. Make sure that perches are securely attached, not loose or swinging. Chickens require full-spectrum natural sunlight for vitamin D and overall health and should have an outdoor run or be allowed to range freely. They also need ready access to cool, shady areas to avoid overheating in hot weather. Chickens enjoy taking dust baths and will do so when they have access to dry dirt. If your chickens are confined to a coop that does not have a dirt floor, provide a sandbox for baths. Predators are attracted to chickens and will hurt or kill them if adequate protection is not provided. During the day chickens should be confined to a fenced yard or run where a secure 6-8’ fence protects them from four-footed predators such as dogs and cats. At night chickens should be placed into a secure coop to protect them from possums, cats, rats, and raccoons. Raccoons are especially dangerous, as they have small, dexterous hands that can reach through small openings. A single layer of chicken wire is not enough to protect your chickens from raccoons and other predators. In areas of the coop where there are no solid walls, we recommend using a durable ¾” wire mesh. Rats and mice carry and spread disease, and large rats will also attack your birds. Check your coop regularly for rodent tunnels or droppings. Keep the area around the coop clear of junk and weeds to discourage mice and rats from nesting. If rodents are present, they can be eliminated with traps or poison placed well away from your chickens and other pets. If your chicken has access to your yard or an outdoor pen, make sure there are no toxins within their reach. Avoid using fertilizer pellets, pesticides, or herbicides in the areas your chickens frequent. Remove any pieces of wire, screws, or other small metal objects that your chickens could ingest. Antifreeze and petroleum products such as oil and gasoline are highly toxic, and should not be used around chickens. Many people enjoy their pet chickens not only for their companionship but for their eggs as well. Most hens begin laying eggs at 5 to 7 months of age. A healthy hen can lay an egg every 1 to 4 days. Egg production peaks at 1-2 years of age, and then slowly declines as the hen ages. It is best to collect your chickens’ eggs every day. If you have found an egg and are unsure whether it is fresh, place it in a bowl of water; fresh eggs sink, while older eggs float. Hens do not need a rooster around in order to lay eggs. Eggs laid without the presence of a male, however, will not be fertile. If you are interested in producing chicks, you will need only one rooster for every 8 to 10 hens. 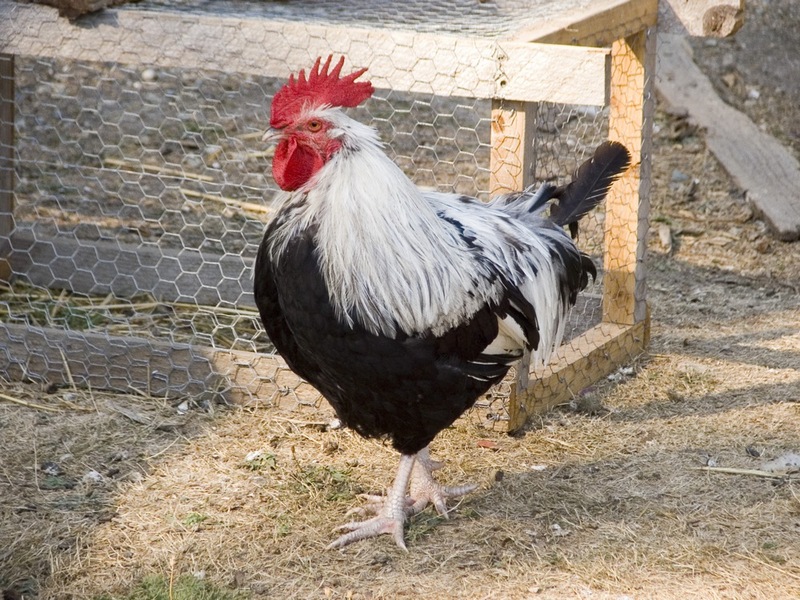 Roosters are colorful and comical and are an interesting addition to your flock. They are also noisy, however, so it’s a good idea to check with your neighbors before buying one. Having more than one rooster can result in territorial skirmishes, and warring parties may need to be separated to prevent bloodshed. Hens need about 14 hours of day length to maintain egg production. Shorter days in the fall and winter will cause a decline or cessation in egg production. Hens will also stop laying during their molting season when they drop their old feathers and grow new ones. 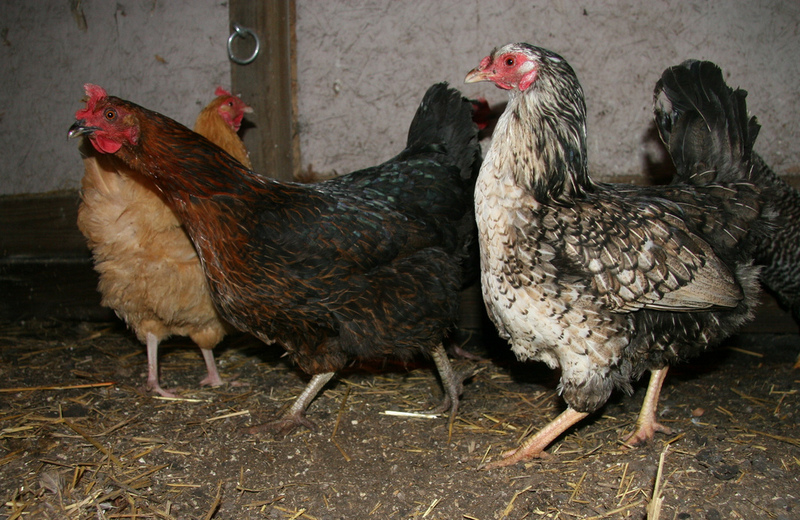 Most hens undergo their first molt at around 18 months of age. A normal molt lasts 2 to 4 months. While young birds molt yearly, older birds may molt more often or irregularly. It is important to observe your chickens every day. 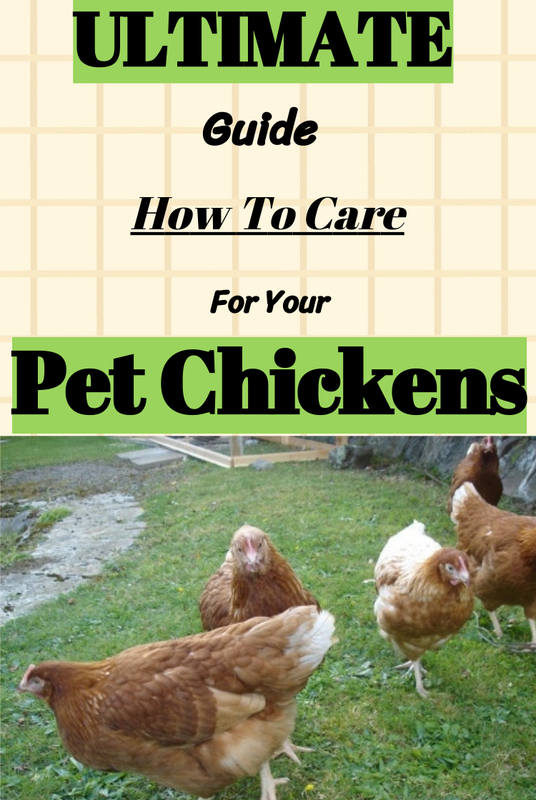 Frequent observation will help you get to know what is and is not normal for your chickens. At least once a week, pick up each bird and ruffle through her feathers. Does she feel abnormally thin? Is her crop distended? Do you see any parasites on her skin? Do her leg scales look rough and thickened? Has there been a change in her behavior or appetite? Is she sneezing, or having trouble breathing? If you notice these or any other abnormal symptoms, isolate the sick bird and contact your veterinarian. Often the best way to find out what ails your flock is to have a thorough necropsy done when one of your chickens dies. A necropsy not only explains the cause of death, but detects viruses, bacteria, and parasites that affect your whole flock. Luckily, the California Animal Health and Food Safety (CAHFS) laboratories provide this service at a reduced fee for backyard poultry. To make use of this service, the chicken should be placed in the refrigerator right away, and then sent to CAHFS as soon as possible via our office. Do not put your bird in the freezer, as this destroys important evidence. Previous Article Raising Chickens 101: Could You? Would You? Should You? Next Article 7 Reasons Why Do Chickens Eat Their Own Eggs and How to Stop Them?